The Smokehouse Products Little Chief Front Load Smoker is an electric smoker with 5 chrome-plated grills that is perfect for the beginner or novice jerky smoker. It’s also great for smoking cheese, just look at the price of Hickory smoked cheese and jerky and you will want to D-I-Y. This lightweight embossed aluminum smoker weighs in at just over 12 pounds, so it’s easy to transport and the 250-watt heating element makes it very affordable to operate, the electricity to operate this little smoker for 24 hours in most areas will cost less than a dollar. And, it’s Made in the America, so your purchase of this smoker helps boost our economy. The Little Chief Front Load Smoker allows you to spread out and smoke lots of thin cuts of meat, fish, and poultry. But, before you buy this great little smoker consider what you will use it for, it’s not a smoker to fully cook large cuts of meat. It’s a small smoker for jerky, fish, and cheese. Do not buy this expecting to cook large cuts of meat, unless you intend to just get the smoky flavor goodness before you put it in the oven or slow-cooker. Yet, for jerky and fish, you can smoke a great deal of meat simultaneously. And, the grates are chrome plated for easy cleanup. This Little Chief Front Load Smoker has a small footprint for apartment and condo dwellers with a small patio or balcony who love the flavor of smoked goodness. Instead of spending big money for smoked salmon, catch and smoke your own salmon and trout with the Little Chief. Your family and guests will love it. This smoker is perfect for smoked salmon, jerky, and cheese. So, invite a few friends over for Saturday or Sunday football and throw in some jerky or sausage, or have a wine and cheese taster. There’s no cheese quite as tasty as hickory smoked sharp cheddar with a dry red wine. 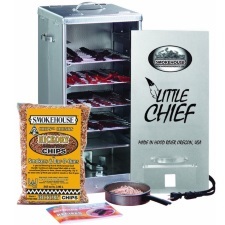 The Smokehouse Little Chief Front Load Smoker is perfect for smoking fish, sausage, jerky, wings, and other small cuts of meat, cheese, and fish. You won’t need a reason to have a party and show off your smoking skills with the Little Chief smoker. This 120 volt smoker with a 250-Watt heating element will give you approximately 165 °F consistent temperature inside the smoker, which is obviously not hot enough to cook a big roast to an internal temperature of 160 °F that most food safety officials recommend; however, for smoking fish, jerky, cheese, or sausage this is the perfect little smoker for that purpose. For apartment and condo dwellers, this electric smoker with a small footprint is just right for those weekend gatherings and patio parties for Sunday football without the worries of charcoal or propane gas. We found 317 verified owners with customer reviews on Amazon, and their average rating was 3.6 stars out 5 stars. 72 percent of customers who purchased the Little Chief smoker rated it either 4 or 5 stars. Most of those who rated this product with three stars or less obviously did not know what they were buying, one complained that it did not cook a seven-pound roast. Perhaps, they would have been better off buying the Big Chief. In summary, this Little Chief front loader is the answer to a jerky, smoked salmon, or cheese lover’s dreams. If you’re looking to smoke a whole chicken, turkey, or roast, this is not the smoker you are looking for, but for smoking cheese, jerky, and fish, this is great.